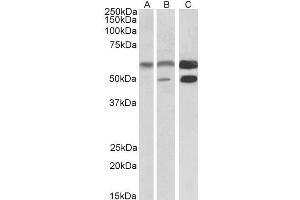 Specificité This antibody is expected to recognize both reported isoforms (NP_057065.2, NP_741960.1). Immunogène Peptide with sequence C-PRTAQSEETRVWHR, from the internal region of the protein sequence according to NP_057065.2, NP_741960.1. DS WB Results: Approx 58-60 kDa band observed in Human (Cerebellum), Mouse and Rat Brain lysates (calculated MW of 55.3 kDa according to Human NP_057065.2, and 54.1 kDa according to to Mouse NP_803126.1 and Rat NP_037052.1). An additional band of 50 kDa was observed in some Rat Brain lysates and wss successfully blocked by incubation with the immunizing peptide. The observed molecular weights correspond to earlier findings with different antibodies from other commercial sources. Recommended concentration: 0.03--0.3 μg/mL. Primary incubation 1 hour at room temperature. DS IHC Results: In paraffin embedded Human Brain Cortex shows granular staining in the periphery of pyramydal cell bodies. Recommended concentration: 3-6 μg/mL. Paraffin embedded Human Adrenal Gland. Recommended concentration: 3.75 μg/mL. Peptide ELISA Statement: Peptide ELISA: antibody detection limit dilution 1:64000. Immunofluorescence: Strong expression of the protein seen in the membranes of U2OS and U251 cells. Recommended concentration: 10μg/ml. Flow Cytometry: Flow cytometric analysis of Kelly cells. Recommended concentration: 10ug/ml.